With so many new companies using premium quality supercritical CO2 extraction, the standard of CBD products is rising; can KOI CBD meet the challenge? KOI CBD is a California-based company that was established in 2015. All of its products contain 99% cannabidiol which is extracted through pharmaceutical grade processes in a facility that is cGMP certified. Every single batch of CBD is traceable from start to finish, and its products contain 0% THC. It sells a variety of products, but we’re going to focus on its CBD oil range. There is also a KOI Variety Pack which gives you 5 bottles for the price of 4. We were delighted to find that KOI CBD has clearly stated the ingredients on the label. For the record, its CBD oil contains (in no particular order) 100% all-natural CBD isolate, propylene glycol, food-grade vegetable glycerin, and some natural & artificial flavorings. In keeping with the company’s stance on transparency, it has published the results of the high-performance liquid chromatography test it performed on its products to prove they contain zero THC. KOI CBD even performed a gas chromatography flame ionization detection test to prove their products don’t contain any terpenes. As a result, no one can be in any doubt as to the reputation of the organization. You can vape KOI CBD oil, and the company offers a number of vaporizer options including a KOI Stik for $16.99 and a KOI Fitt Starter Kit for $44.99. The KOI Stik is a very handy device as it makes the vaping process easy. It also has an extremely impressive battery life. The battery still operates at 80% power after 300 charges which makes it one of the most durable on the market. When it comes to the taste of the various vape juices, it is entirely a matter of personal preference. We found that the Red Koi option tasted okay while the Gold Koi offers a unique and very pleasant aftertaste. If we’re to be critical, we would have to say that the additives placed in the CBD oil are quite apparent and may not be to everyone’s taste. When it comes to KOI’s CBD Vape Juice, you should use it exactly as you would an e-liquid. This enables you to get an even dose of CBD throughout the day for maximum impact. As there are no special settings or wattage requirements to worry about, you can use the juices in any vape device. Each dropper contains 20 drops for a total of 1ml, and KOI CBD recommends that you take a maximum of 3 x 1ml doses a day as needed if you are using it as a tincture. In this case, hold the drops underneath the tongue for up to 20 seconds before swallowing. The company also recommends that you wait up to 3 hours after your first dose to see how the CBD affects you. The whole point of KOI CBD products is to use them as an alternative to traditional medicine. If you’re looking to deal with conditions such as anxiety or depression, you can start with one of the lower strength options. However, if you suffer from chronic pain, we recommend using the 500mg or 1000mg bottles. According to the litany of customer reviews we have read, KOI CBD Vape Juice does an excellent job when it comes to reducing symptoms of anxiety such as dizziness, shortness of breath and high blood pressure. Typically, in these situations, people must use prescription or over the counter medicine but KOI’s CBD products make these drugs redundant. Users suffering from chronic pain were also delighted at how quickly the higher strength doses work on reducing it. In fact, the products are so effective that some users took several days even to notice the pain was gone! If you go to the website, you will encounter an impressive array of testimonials from users suffering from ailments such as PTSD, Diabetes, Epilepsy, Sleep Problems and Stomach Disorders. In every case, their suffering was eased through regular usage of KOI CBD products. Where Can I Buy The KOI CBD Range? 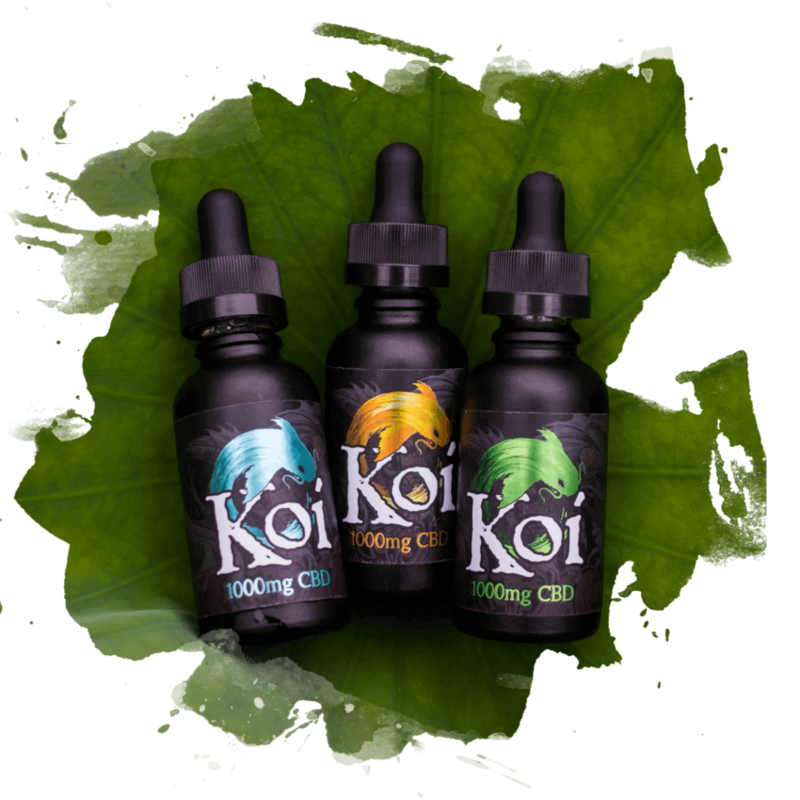 While we have spotted the KOI CBD range on sale in different online outlets, it is always best to make your purchase from the Official KOI CBD Website. If you’re looking for something other than vape juice, why not try the company’s Tropical Gummies or Lavender Oil? It is also about to release a new product called KOI Naturals. KOI CBD is working hard to establish a positive reputation in what is a competitive market. Despite posting proof of the quality of its products on the site, the company still invites customers to ask further questions. Overall, we believe that KOI CBD sells premium quality products, but you must be prepared to pay extra for the privilege. If you purchase the 1000mg bottle, for example, you only receive 30 servings for $99.99. For users that consume three servings a day, a bottle will last just 10 days. However, we would argue that people who suffer from chronic pain will have no issue paying this sum of money. Certainly, the quality of the products isn’t in question, and we love the fact there are so many flavors.